Normally, comparing one car buying scenario with other scenarios is extremely difficult since each comes with its own unique price, insurance costs, financing terms, MPG rating, and so on. That is, until you discovered this calculator. This total car cost calculator will not only calculate the annual, monthly, and per mile cost of buying, owning, and operating an automobile, but it will also allow you to calculate those costs side-by-side with a second car buying scenario. 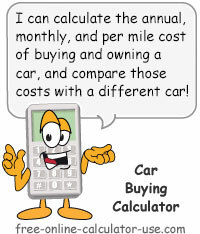 Plus, unlike other car buying and car financing calculators, this calculator will also calculate the number of hours you will need to allocate to working in order to stay current with the costs of ownership (I hope you enjoy your work). And finally, once you have calculated the purchase and ownership costs for one or two buying scenarios, the calculator includes a printer friendly report that you can print out and use to compare with numerous other buying scenarios. Since sellers of automobiles typically only disclose the upfront costs of buying a vehicle, you will likely be shocked at how much it costs to own and operate a motor vehicle if you account for all of the expenses that come attached to the purchase. The price tag is only the tip of the car cost iceberg. Calculate and compare vehicle purchase and ownership costs, most of which are not fully disclosed in the car dealer's sales pitch. If you would like to enter numbers for two different vehicles at once, move the slider to the "Yes" position. Otherwise, if you are only concerned with the purchase and ownership costs of a single vehicle, move the slider to the "No" position. If you are entering two different car buying scenarios at once, you can leave the "Double?" switch set to "No" and complete the left-hand fields on each row. Then, once you have the single scenario completed you can move the "Double?" switch to "Yes" and click this button and it will copy the values in the left-hand fields to the right-hand fields. Optional: If you would like the car buying calculator to calculate the number of hours you will have to work each year to stay current with the costs of ownership, enter your real hourly wage in this field. Tapping on the link will open the Real Hourly Wage Calculator in a new window. The following 16 rows each contain two fields. The left-hand field in each row is for a single car buying scenario (I have included sample values you can use as a guide). If you chose to include a second car buying scenario above, then the right-hand fields are for the second car buying scenario. Otherwise, if you said "No" to the double scenario, the right-hand fields will be disabled. Important! Please don't let the number of fields detour you from benefiting from the use of this calculator. Buying a car is a huge financial decision so I strongly urge you to give it the time and attention it deserves. Enter the total price of the car. If your are buying a new car, include the price of all options and add-ons. Enter the total of any purchase fees. These can include registration, document, and dealer fees. Enter the total percentage of all sales tax rates that will apply (local, state, etc.). Enter the amount as a percentage, but without the percent sign (for .07375 or 7.375%, enter 7.375). Enter the annual cost to license the vehicle. Generally speaking, the more expensive the vehicle the higher annual license will be. If you purchase an extended warranty, enter the price on this line. Keep in mind that an extended warranty is just an insurance policy. Meaning, like all insurance policies, the issuer of the policy has calculated that you will not have any trouble with the car until after the extended warranty expires. Will you be financing?Will you be financing this vehicle?Will you be financing this vehicle?Will you be financing this vehicle? Will you be financing this vehicle? Select "No" if you are paying cash for the vehicle. Select "Yes, With Fees" if you will be rolling the purchase fees, sales tax, licensing, and warranty into the loan. Otherwise, select "Yes, Minus Fees" if you will paying cash for the purchase fees, sales tax, licensing, and warranty. Enter the a percentage to compute the down payment amount, expand the description and enter the percentage (without the percent sign) and the calculator will calculate the amount and enter it into the appropriate fields (Total price of car entry is required). Enter the amount of your down payment if you are financing the vehicle. Or, if you want the calculator to use a percentage to compute the down payment amount, expand the description and enter the percentage (without the percent sign) and the calculator will calculate the amount and enter it into the appropriate fields (Total price of car entry is required). If you are financing the vehicle and you are trading in a vehicle, enter the net trade-in value (trade-in value less what you owe on the vehicle being traded in). Enter annual percentage rate you will be charged by the auto finance company. Enter as a percentage, but without the percent sign (for .095 or 9.5%, enter 9.5). Enter the term of the car loan in months (3 years = 36, 4 years = 48, 5 years = 60, 6 years = 72, and so on. Enter the dollar amount of the annual insurance premium. Call your auto insurance agent for a quote. Typically the more expensive and the more sporty the vehicle, the more it will cost to insure. To convert non-annual miles into annual miles, enter the miles and select the timeframe below. Enter the number of miles you think you will drive the car per year. If you would like the calculator to convert non-annual miles into annual miles, expand the description, enter the miles and select the timeframe below. Enter the average number of miles per gallon (MPG) you will get from the vehicle. If two mpg ratings are stated, enter the lower of the two. Enter the current cost of one gallon of gasoline purchased locally. I suggest inflating this figure since the cost of gasoline is always inching higher over time. Enter the age of the car in years. If this is a new car, either leave blank or enter "0". The newer the car, the faster the car will depreciate in value during the first years of ownership. Enter the number of years you plan to own the car. The longer you own the car, the lower will be the average annual cost of depreciation. Enter a percentage to arrive at an estimate of maintenance costs (average is 3% of purchase price per year). Enter the monthly cost to repair and maintain the vehicle. If you are not sure, expand the description to multiply the price of the vehicle by a percentage to arrive at an estimate (average is 3% of purchase price per year). Newer cars tend to have a lower annual cost, whereas older cars tend to have a higher annual cost. This is the combined total of the car price, purchase fees, sales tax, license, and warranty. Indicate whether or not you want to do a side-by-side comparison, or just calculate the purchase and ownership costs of a single vehicle. If you want the calculator to calculate how many hours you will need to allocate to working in order to cover the purchase and ownership costs, enter your Real Hourly Wage. Complete all 16 of the purchase and ownership cost related fields. Instructions for each field can be opened by tapping their adjacent "i" icons. Some of entry rows also include expandable mini calculators for determining the values to enter into the main calculator. Note if you are doing a side-by-side comparison, you can save some time by completing all of the single scenario fields first, and then scrolling back up to the top of the calculator, moving the "Double?" switch to "Yes", and then tapping the "Copy #1 Entries to #2 Fields" button. Tap the "Calculate Car Buying Cost" button. This will populate the Purchase and Ownership Costs Chart cells with the calculated values, as well as generate a summary and a "Printer Friendly Report" button. The out-the-door (OTD) car price is only the tip of the car cost iceberg. When you are looking to buy a car do you only consider the monthly payment when deciding whether or not you can afford to purchase the car? If so, then your "personal finance" luxury liner stands a good chance of meeting the same fate as the Titanic. The moment you sign on the dotted line of an automobile title, you immediately obligate yourself to a host of costs that come attached to the price tag. 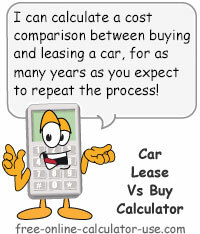 Let's briefly discuss each cost before we use the car buying calculator to expose and size up the costs that are located beneath the surface of an auto purchase. In addition to the purchase price of the car, you can also expect to be charged sales tax (if applicable) as well as your initial title transfer and license fees. Sadly, many people simply add these costs to the financing package, meaning they will be paying interest on these upfront fees for years to come. This is the most important, yet most overlooked and least understood of all costs associated to buying and owning a vehicle -- or any other depreciable asset for that matter. In case you don't know what "depreciation" is, depreciation can be defined as the amount by which an asset wears out (or progresses toward becoming obsolete) for a given period of time. Or to put it another way, depreciation is the drop in resale value (what you can sell the asset for) for a given period of time. Typically an asset depreciates at a faster rate when it's newer, and at a slower rate as it becomes older. As it relates to an auto purchase, the value of the monthly depreciation of a vehicle is equal to the amount you should be setting aside in order to replace the vehicle once it has reached the end of its useful life. If you're not setting aside a vehicle's depreciation as it occurs (which is over above any auto loan payment you're already making), guess what you will have to do when it's time to replace the vehicle? Yep, you're going to have to continue to pad the huge bonus checks being paid to the lending institution executives. But wait! It's not enough to know what depreciation is, you must also understand the difference between two types of depreciation. In addition to normal depreciation that occurs as an asset wears out or becomes obsolete, there is also a type of depreciation I refer to as Warp Speed Depreciation. Warp speed depreciation is the type of depreciation that occurs the moment something goes from being "new" to being "used." The instant you sign the papers to become the proud owner of a brand new car, the brand new car becomes a "used" car and the resale value plummets by as much as 20% of the purchase price! This means that the absolute worst thing you can do is to buy a brand new vehicle every 1-2 years. That's because your average annual cost of depreciation will likely run in the 20% range, whereas buying a new car every ten years, or a two-year-old car every two years, may lower your average annual cost of depreciation to under 10%. If you want to see for yourself just how drastic of an effect depreciation can have on your potential future wealth, be sure to experiment with various new and used car buying scenarios using the Car Depreciation Calculator. If you finance a car purchase, you will increase the cost of the car by the amount of the interest charges and loan fees that will be tacked on to the principal borrowed. Of course you will also need to make insurance premiums on your car. Typically the more expensive and more sporty the car, the higher your insurance premiums will be. Even higher if you are forced to purchase full coverage in order to qualify for financing. The more you drive your car, the more it will cost you to fuel the vehicle. If you want to calculate MPG and compare car gas mileage expenses, be sure to try out the Fuel Mileage Calculator. On average you can expect to pay 3% of the purchase price per year to repair and maintain your car (less in early years, more in later later years). If you do the repairs and maintenance yourself, the cost would be what your time is worth if you had instead used that time to earn an income. If you park your car in a garage, any utilities attributable to the garage -- along with the depreciation of the garage structure and fixtures -- is all part of the cost of owning the automobile. Everything you own that can wear out or become obsolete, is doing so at this very moment. If it were possible to install a cost of ownership meter on your life, you would be shocked at how much value the whole of your possessions loses on a daily basis. Unfortunately these costs accrue without a meter to track them, and often only come into light as each asset needs replacing. When it comes to buying and owning assets that wear out or become obsolete, the bottom line is that if you are not setting aside money to replace these items as they wear out, your financial net worth is likely losing ground, not gaining ground. The more things you own, the more the things you own ... OWN YOU!